I arrived in Nenagh around lunchtime. I was sitting in the camper having a sandwich when I noticed a man walking past with his clubs, giving the camper a good once over. He was parked a few cars away. I carried on and shortly afterwards I was getting my stuff ready when he walked up and said hello. His name is Tom O’Connor. He is a young man (younger than me anyway) interested in the camper van as it was something he was mulling over for future holidays. We started talking, as you do, and I told him about the book. Then he asked where I played. When I said ‘Greystones’ a slow smile spread across his face. “Do you know my dad, Louis?” he asked. 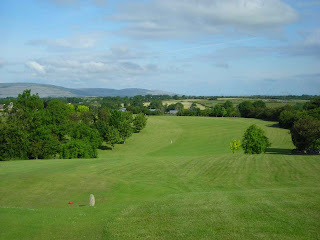 Turns out that Tom grew up playing golf at Greystones – as did I – but our paths never crossed. We know the same people but he’s a few years younger than me. He also used to live down the road from where I grew up. Small, small world. 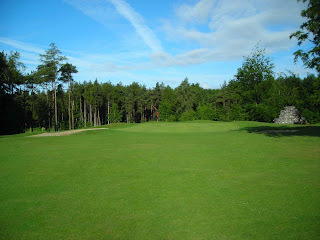 Tom had already played eight holes but came out and played the full 18 with me. Now Tom’s the kind of guy who hits the ball a mile down the middle of the fairway, but when he misses you can hear air raid sirens in neighbouring counties. That amazing ‘swoosh’ tears off the ball as it takes flight. I tried to emulate him a couple of times and lost two balls in quick succession. 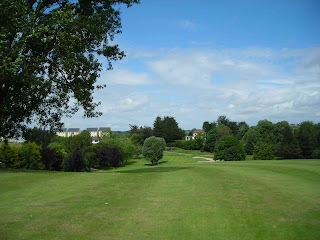 Nenagh is not a place to be thrashing the ball about and it’s a pretty, country parkland course that moves easily over the gentle hills, with plenty of variety and interest. Interestingly it was designed by Merrigan, who also designed Greystones (before Kirby’s redevelopment), and the bunkers felt very familiar. We were going to grab a bite to eat but Tom got a message from his wife and had to scamper home to look after their two very young kids. 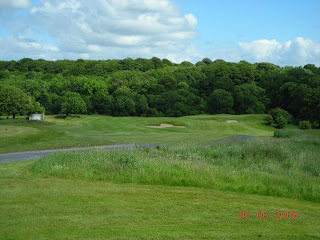 The clubhouse is of the older variety, a little worn around the dges and a fresh lick of paint would make all the difference. But since showers came up in my last post, the ones here actually hurt. They’re so hard it’s like being stabbed by needles. Perfect. 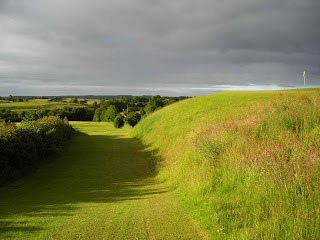 Curra West is an interesting little place, not far from Loughrea. For starters, when I arrived I had no option but to park on a steep slope – the result of which was my waking up the following morning with my face squashed against the front windscreen. Not that comfortable at 6am. 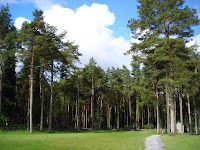 Since it was still daylight when I arrived, I walked around the facilities – you’ll want to wash your hands after walking around the locker room – and realised this is a threadbare type of golf course. There’s nothing fancy and it falls into that ‘farmland’ category that needs to be added officially to ‘links’ and ‘parkland’, and all the rest. There are a growing number of these around the place and if they just stick to the truth about the kind of golf they offer then they’ll do well. Courses like Mount Temple – which firmly falls into this category – really cheese me off because they pretend to be something they’re not. Their claim to be a ‘championship’ course is laughable. Holding the final of the local scouts’ matchplay competition simply doesn’t qualify. I’m being flippant, but it’s a point I’ve raised before and one I still haven’t received a satisfactory answer to: what qualifies a course to claim ‘championship’ status? 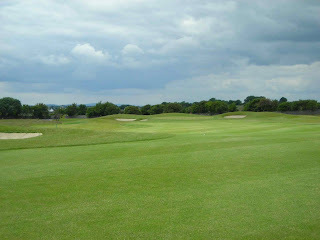 But Curra West has its quirks and amusements, and numerous par threes - it’s a par 67 – so people will have fun. 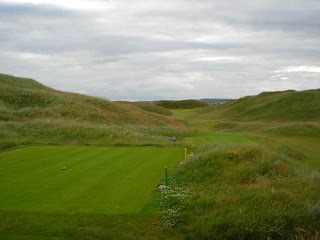 It will be dangerous at busy times though, because it’s tight and also because it will attract golfers who are not exactly in control of their direction. And all this for just 15 quid. I try to take a day off in the middle of my trips. I get to relax for a while and do the mundane things, like laundry. 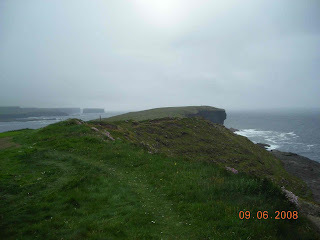 I was in Kilkee for the day – a very quiet little town that must overflow with tourists in the summer, but still quiet in early June. There was little to do, but at least I had something else in mind. I drove out to Loop Head for the day. 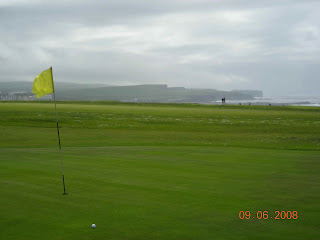 Two weeks ago, when I played The Cashen course at Ballybunion with two priests, they picked out Loop Head across the water [Photo: the tip of Loop Head in the distance, from the 16th green] and I decided to visit it if I had the chance. I chose the former, and found myself approaching an enormous island of rock that seemed only a jump across the void. From some angles it looks like it has just been parked badly; from others, like a sullen teenager. 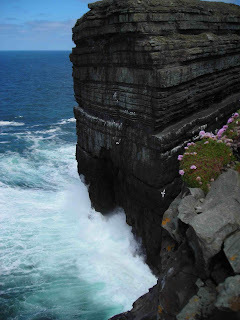 With its myriad of rock layers it is home to thousands of birds and you can sit and watch them for hours as they swoop down towards the most perfect blue water that thunders against the base. The way the ocean retreats, like a child taking a breath to blow out his birthday candles, before hurling forwards again brings out the goosebumps. The sound is terrifying. But for the ultimate thrill – and I don’t recommend it – go past the rock and you will find a nice, wide, rocky ledge on the mainland. It’s down a couple of feet and it is a straight drop down two or three hundred feet. Get down on your belly and crawl to the edge – remembering to remove hat and glasses first, Now, look down. It will make your head spin, but what a view. And if you wait long enough, you can feel the vibrations of the sea pounding the rocks. Be sure to retreat carefully. The Cliffs of Moher up the road are bigger and more impressive, but this is isolated and closer to the edge. And if you have a dog, do not let it run loose! I played on my own for a while, and encountered three very elderly gentlemen on the 9th. 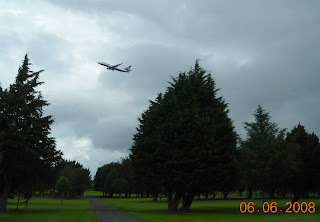 I was walking to the 10th tee when they headed across from the 1st green to one of the later holes. Within two holes I had caught them up. Once they saw me they waved me through and pleasantries were exchanged. Then on 16, I encountered them again. 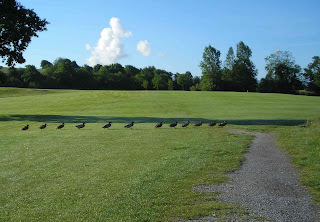 Clearly they have their own special route around the golf course. 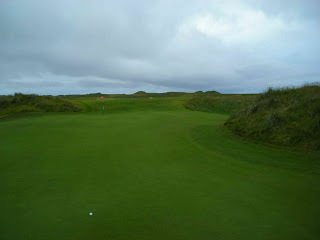 On 17 I was joined by three Limerick lads who cut across for a quick finish. Ned, Seamus (aka Sammy) and Tony then invited me down to Scott’s (a famous watering hole in Kilkee town) for a drink. Sammy, who runs a bar in Brooklyn, was home for a few days, catching up with friends. You can take the boy out of Ireland… A drink became two and it was threatening to become a session, when they decided to do the sensible thing and go home. Shame really, we were talking rugby and the 2009 Munster vs. the All Blacks game was mentioned. I was hoping to find a way to wangle some tickets. Ned was at the match when Munster famously beat the All Blacks in 1978. No really, he was. ‘Along with the other 150,000,’ he joked. He had a brilliant marketing strategy, which was to allow everyone who still had the original 1978 ticket stub free entry to the 2009 game. As someone with a marketing background I thought that was a superb PR exercise. 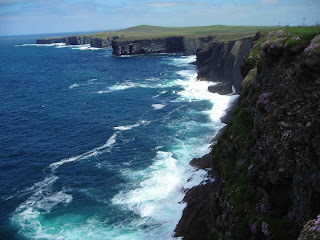 Ronan treated me to a good lunch – many thanks for that – before we parted company and I headed for Kilkee. 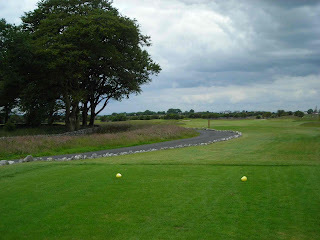 But, rather ironically perhaps, the clubhouse is also home to a Driving School – the vehicular kind, so don’t be surprised to see some erratic driving in the car park! 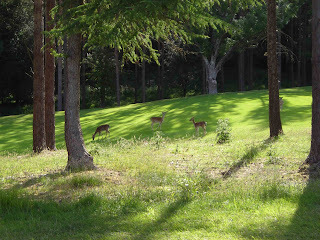 My arrival at Woodstock Golf Course (near Ennis) on Sunday morning could not have been worse. My 10am tee time reservation had not been put in the book and the time sheet was packed. The rather unhelpful lady (there’s a thin line between efficient and officious) in the shop didn’t seem bothered that I wouldn’t be able to get out. I said I’d wait and see if there were any groups coming that I could join, to which she replied that I wasn’t allowed to play as a five ball. I was this close to saying “Duh!” but I resisted. The timesheet had some blanks after 1 o’clock so I said I’d play then instead and I returned to the camper van to do some work. I returned at one o’clock to find my name had not been put on the timesheet and that the relevant slots had since been booked by other groups. 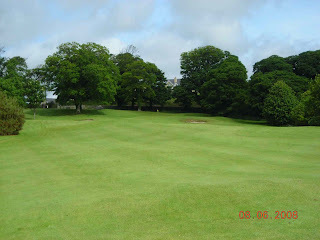 The original lady had gone by this stage and I ended up walking the course, in a bad mood! I confess I wanted to dislike Woodstock, but it wasn’t easy to do. 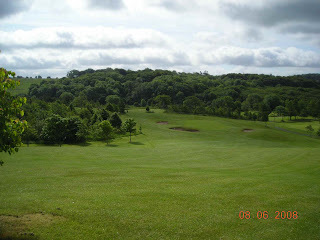 It’s a nice parkland course and it will mature impressively. I was down on the 7th – Index 1 – where a small lake provides the drama for 7 and 8. And here I watched four swallows playing over the reeds. We have swallows nesting at home but I had never seen this: they had picked up a piece of white fluff (a small feather I guessed) and were racing around the place, dropping it every few seconds. As it floated down to the water, another swallow would swoop in and catch it. And this went on and on. 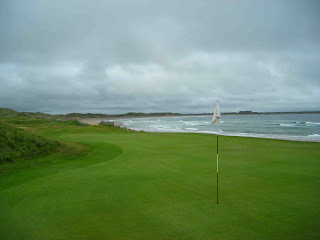 I was also impressed on 13 when a member of one of the groups I was following, hit his second shot to about five feet, still smoking his cigarette. Even when I congratulated him the fag stayed firmly in place. It’s part of a hotel but I found it a bit grotty (I finally get my dig in). Besides, friends of mine had put me up for two nights just down the road. Nothing like a bit of home comfort. When I got back, Christine asked for a tour of the camper. Her three kids came too, and so did their friends. My four berth camper ended up with about ten kids aged between 3 and 10 crawling all over it. Frank (Mark and Christine’s youngest and the only boy in the group) got behind the steering wheel straight away. One of the girls who I didn’t know asked me if this was my home. When I said ‘yes’ she looked around and screwed up her face in horror. Nothing like an 8 year old to put you in your place! 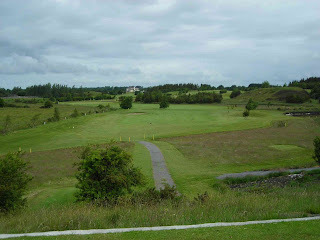 East Clare is about as peaceful a golf club as I have encountered. At the end of a long, narrow and winding road you feel miles from anywhere. And there are very few houses on the surrounding hillsides. Much more like the rural Ireland that everyone envisions, but seems so rare nowadays. 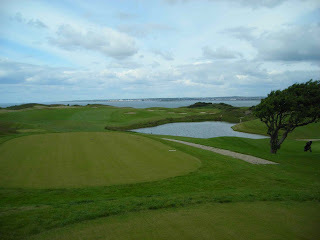 True, there’s a timeshare village beside the clubhouse, but it is not on view from the course. It’s a strong, rural course that has good claims to fame. There is a lot of water to deal with, and that only means one thing… ducks. They believe in keeping an orderly line, evidently. Mike in the pro shop told me one of those great little tales that almost seems unbelievable. A fox had been fed by members over the years and had worked out how to get grub out of golf bags. He would regularly unzip the bag and steal mars bars and bananas. On one occasion there were no mars bars or bananas so he stole the next best thing: a wallet. A wallet containing £4,000 sterling. It belonged to the organiser of a group of English guys, and he was in charge of the money. The fox ran off; the guys followed, disappearing into the wild stuff. But to no avail, the fox was gone. 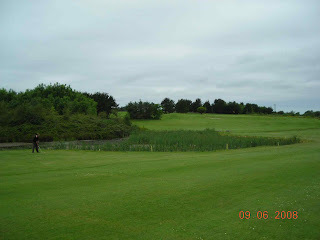 The guys played on and when they were coming down the 18th, which runs parallel to 11 where the wallet was stolen, they ventured into the rough again and finally discovered the wallet. Believe it, or not! I was out with the greensmen again at Limerick County, and a couple of young families too. 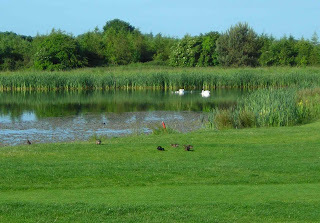 On 17 I encountered a pair of swans and cygnets on the pond, and a duck with her ducklings playing around on the edges (see pic). It has to be said that little things like this really add to a round of golf. 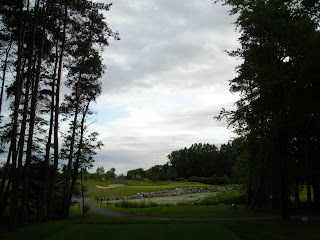 I also saw a fox on 13 – heading for the 17th! 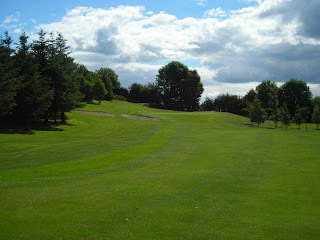 After a long chat with Gerry, the Manager, I discovered that 17 and 18 are to be changed, to allow the 18th to return to a par five. It will make for a fine finish. 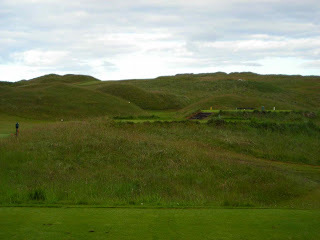 Rathbane passed quickly by – a municipal course that feels like a clock face with holes shooting out in all different directions. 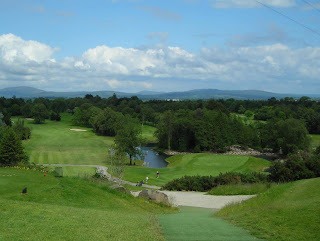 Next was Castletroy and Eddie Connaughton’s design work is looking spectacular on a suburban golf course. 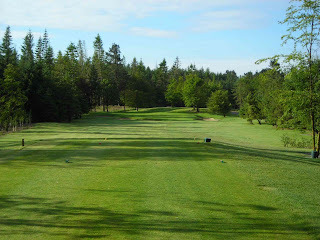 True, it was a sunny day, but the course just looked perfect and trees seemed to be positioned effortlessly, both to look good and to frustrate. I had a couple of interesting encounters. 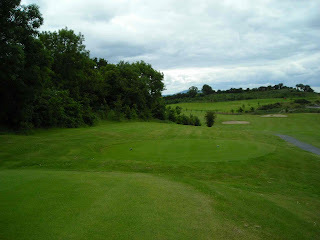 First, I was invited to play with three young lads (mid teens), Donal, Kevin and Rory, for one hole. They then said to play through, but with all the three balls ahead it was pointless. They were an entertaining and bickering trio who know how to push each other’s buttons – especially Kevin. Donal guessed that I was writing a book and from then on they were determined to get themselves into the book, no matter what. I was told – not by Kevin I might add – that Kevin had just won a Senior School’s Rugby medal with Castletroy School. He’s only in 4th Year, so who knows, we may see him in later years playing for the mighty Munster. Rory was the quiet one, and Donal, a leftie, has the most outrageous handicap of 15. The boy can hit the ball. He had a birdie putt on 15 and then chipped in for a birdie on 16. “Put that in your book,” he said. 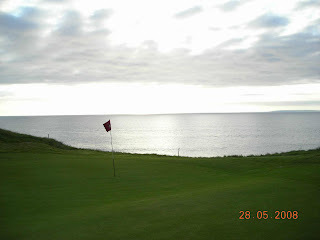 I will add that the 15 handicap is for Lahinch. And if you read this guys, you’re in the book. Happy now? I wake up and it’s raining. Two weeks of glorious sunshine are forgotten in a heartbeat. I’m about to play the Irish Open venue and it’s raining. In June. 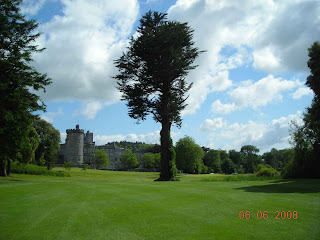 I’m parked in Adare Manor Golf Club as Adare Golf Club didn’t want me parking overnight. 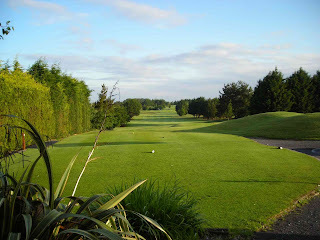 No problem, as the clubs are a few hundred metres apart – in fact the 3rd tee at Adare Manor and the 15th at Adare are practically joined. 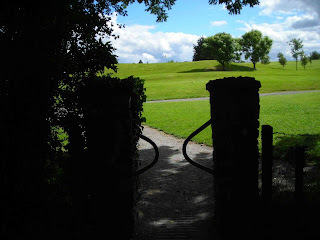 So I drive the 500 metres only to discover at Adare Golf Club’s Security Hut that I have a puncture. As a quick aside, this is my third puncture in under a week. 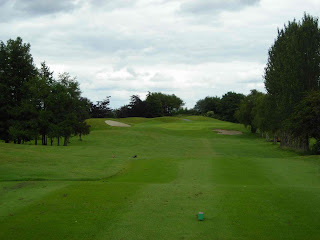 I had one at Limerick Golf Club last Thursday, and when I replaced it with the spare I discovered that had a puncture too – a slow one. I ended up driving home to Wexford for the long weekend stopping to pump up the tyre every 40 minutes. 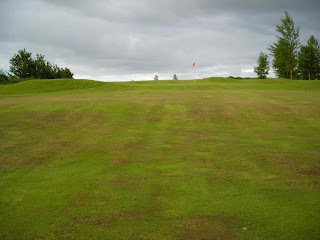 It was too wet to change the tyre at the clubhouse, so I left it hoping that things might be better by the end of my round. 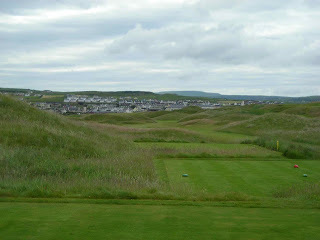 I got to the tee just as three Scots teed off and they invited me to play along. I happily accepted, a) because they were Scottish, and b) because it was raining. 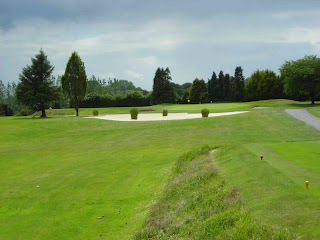 They were in buggies and the course’s Starter, Pat, took my trolley and left it back in the pro shop. I might add that when he heard I had a puncture he said to get the pro shop to call a local guy, Tom, who would come and fix it. That’s what I call customer service. 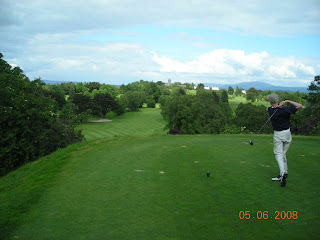 So I ended up playing with Tommy, Jamie and Ian, all members at West Kilbride Golf Club, 20 odd miles from Royal Troon on the west coast. Did you know that the word ‘Scotch’ can only be used when talking about whisky or those rather revolting Scotch eggs. Sadly, you can’t ‘go Scotch’, the same way you can ‘go Dutch’ at restaurants. And Scotch whisky leaves out the ‘e’ that you get with Irish whiskey. My old Geography teacher, Mr Lush, Sir, informed us that the ‘e’ is for Everything. Back to the golf. 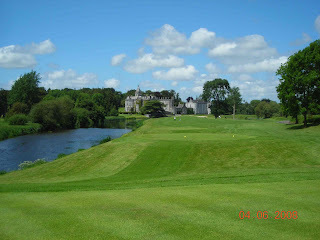 Adare is a stunning, stunning course. It is also very tough. 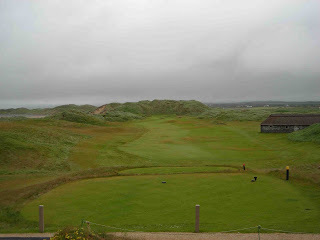 Yes it was raining and windy, but it is a brute if you stray into the rough because the ball just sits down in it. You could go anywhere, if you’re lucky enough to go anywhere at all. 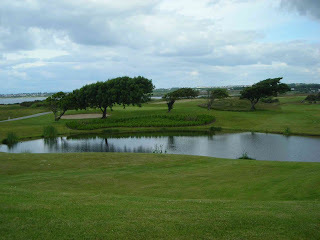 And when the water appears after four holes, it is big and dangerous. 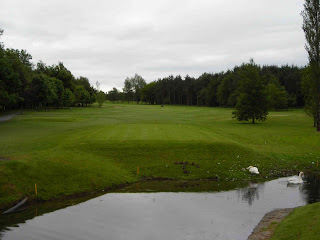 I put two in the lake at the 7th, and was too wet to play a third. 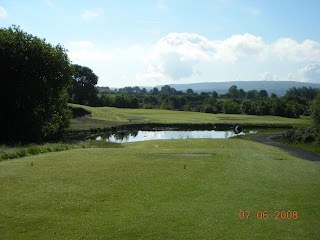 When the sun finally came out on the 10th, it showed off the course in a whole new light (no pun intended), not least because the Manor makes a big appearance on the later holes. 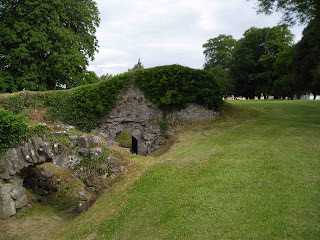 As does the River Maigue. On 15 and 18, the fairway hugs the river a little too intimately and you can quickly tell why the 18th, a par five, is Index 2 (pictured). 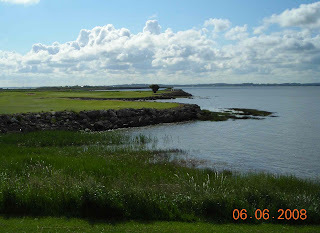 Tommy, who had played with the others the day before – one of their pals from West Kilbride now works at Adare and they had come over to visit him – showed me the exact spot where Richard Finch fell into the water on his way to winning the Irish Open a few weeks before. 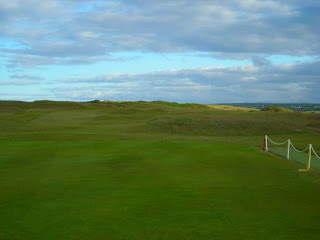 It’s not an easy hole to par, even if you play it sensibly. 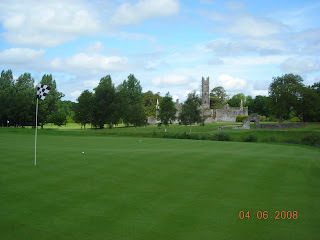 It was a slow round as we were behind two other fourballs – the first one going in slow motion – so when we got back to the clubhouse I was already an hour late for my second round, at Adare Manor. And that’s when I remembered that I still had a puncture to fix. At least the sun was out. The tyre was ruined as I’d been made to drive it from the security hut to the clubhouse and the wheel rim had torn the rubber to shreds (€80 to replace it). So a personal thank you to the beareded prat in the security hut for being so unhelpful. In fact, scratch that, he wasn’t unhelpful, he was plain rude. I had to wait while he ‘made calls’ just to get past the barrier. I guess my 1989 camper van can do that to people. 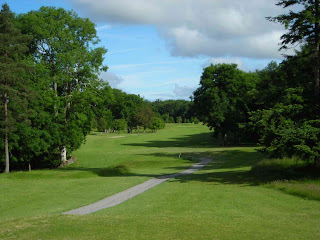 Fortunately, everyone else at Adare was brilliant – so thank you to Joe, Valerie and Pat and the gang in the pro shop, and also to Tommy, Jamie and Ian for the golf.